Germany's so-called Nazi Bride broke her silence Wednesday, more than two years into a trial alleging that she participated in a racist killing spree. 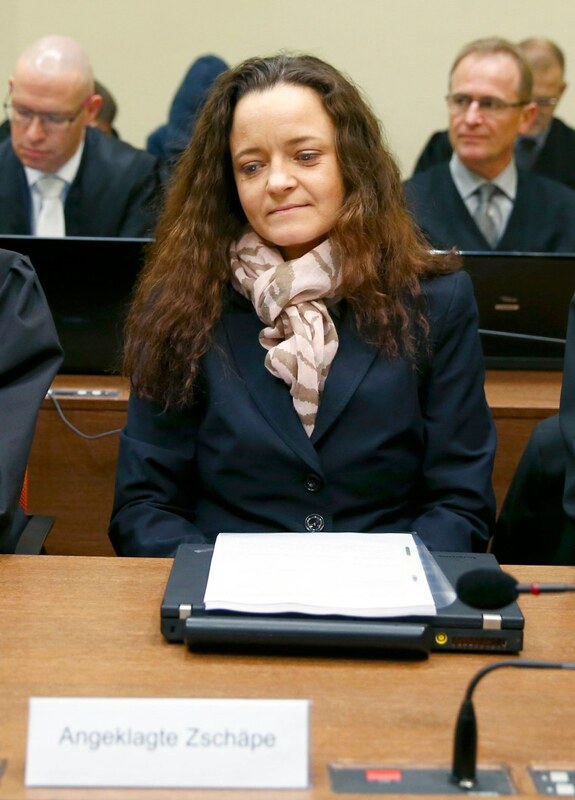 MAINZ, Germany — Germany's so-called "Nazi Bride " broke her silence Wednesday, more than two years into a trial alleging she participated in a racist killing spree that left 10 people dead. Beate Zschaepe, 40, is accused of being the sole surviving member of the National Socialist Underground (NSU), a neo-Nazi terror cell behind a series of murders over a seven-year period. The gang also conducted two bombings in immigrant areas of Cologne and 15 bank robberies, prosecutors say. In a written statement read by her lawyers in a Munich court on Wednesday, Zschaepe denied participating in the murders committed by two of her close friends. Zschaepe insisted she was only told about the slayings after the fact and rejected prosecutors’ allegations that she was ever part of the NSU. “I was involved neither in the preparations, nor in the carrying out,” Zschaepe said in the statement, acknowledging that she felt “morally guilty” that she could not prevent the crimes. Zschaepe added that she was not strong enough to break away from the group and was financially dependent on the gang's ringleaders. She described distracting herself by playing computer games and drinking up to four bottles of sparkling wine a day. "It was very clear to me that I couldn't return to normal life," Zschaepe added. "They didn't need me — I needed them." However, Zschaepe admitted that she burned the group's final hideout in Zwickau in Eastern Germany. She was arrested in 2011 and the trial got underway two-and-a-half years ago. Zschaepe has been charged with founding a terrorist organization, involvement in the 10 murders, taking part in two bomb attacks and destruction of evidence by arson. If convicted, she faces life in prison. Zschaepe has been dubbed the "Nazi Bride" by German media and "Hitler child" by anti-racism demonstrators. Between 2000 and 2007, Zschaepe and the two known other members of the cell — Uwe Mundlos and Uwe Boehnhardt — allegedly murdered eight men of Turkish origin, a Greek migrant, and a German female police officer. Mundlos and Boenhardt were found dead following a bungled armed robbery in November 2011. Zschaepe turned herself in to police three days later. The court case has turned the spotlight on Germany’s security agencies, following revelations that officials had sources close to the group. The gang was only discovered by chance after a weapon found at the scene of the double-suicide was linked to the 10 murders. Investigators also discovered a grotesque DVD presenting the NSU and claiming responsibility for the killings. In it the bodies of the murder victims are pictured while a cartoon Pink Panther tots up the number of dead. Victims relatives were disappointed that Zschaepe did not personally speak and said that her statement did not reveal much. “If this was all that Mrs. Zschaepe has to tell us, then she should have better not said anything,” one of their lawyers, Stephan Lucas, told reporters. Andy Eckardt and Reuters contributed.